Ethiad Airways made the first commercial flight on fuel made from plants grown in saltwater by Khalifa University. Burning jet fuel made from halophyte plants grown in salt water and fertilized by the shrimp and fish living in the salt water enabled a flight from Abu Dhabi to Amsterdam on January 16. 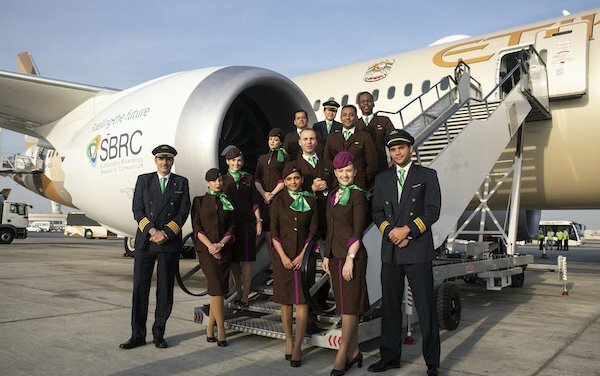 It was the first flight on pure biofuels, even though commercial airlines have made over 160,000 flights on blended fuels since 2011. Chief Scientist at NASA Langley Dennis Bushnell shared information on halophytes, plants that grow in salt water. He presented such ideas at a symposium your editor attended six years ago, and his vision is now being realized. He points out that 70 percent of all water in the world has a high saline content and over 40 percent of all lands are arid and cannot sustain conventional agriculture. You can see a slide show of his presentation on halophytes here. 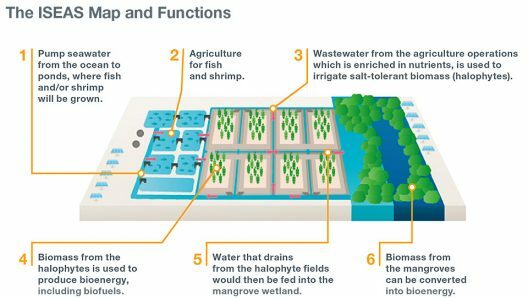 The Seawater Energy and Agriculture System (SEAS) is a synergistic industrial platform that supports the aviation sector, the oil and gas industry, food production and the creation of a new agricultural alternative in the UAE. Considering groundbreaking for the site that combines aquaculture and halophyte oil plant growth took place in June, 2015, progress has been rapid. The site, designed with technical support from CH2M-HILL, was completed before the end of that year, It has been producing seafood and biofuels ever since. All this activity is overseen by the Sustainable Bioenergy Research Consortium (SBRC), a non-profit entity established by Masdar Institute that is part of Khalifa University of Science and Technology. Sustainable fuel for the flight was derived from oil in Salicornia plants, which were grown on the two-hectare SEAS farm in Masdar City. SEAS is the world’s first desert ecosystem designed to produce fuel and food in saltwater. Fish and shrimp raised at the facility provide nutrients for the plants as well as contribute to the UAE’s food production. Abu Dhabi National Oil Company (ADNOC) Refining uses UOP-Honeywell’s Ecorefining technology to take the raw Salicornia pressings to “stringent jet fuel standards.” Abu Dhabi Vegetable Oil Company assisted in the pre-treatment phases. Operated by the SBRC, the SEAS pilot facility became operational in March 2016, a year after ground-breaking. Only two hectares (4.92 acres) produced all the product for this first pure Salicornia oil for the Abu Dhabi to Amsterdam flight. The system will expand to 200 hectares (492 acres) in the next few years. This rapid expansion of agriculturally-derived fuel has several features that give it great credibility. In this case, it uses plants grown in otherwise hostile conditions. It produces food for human consumption while growing plants that provide jet fuel. Its aviation products burn cleaner than fossil-fuel equivalents. Let’s hope for more such developments in the near future.